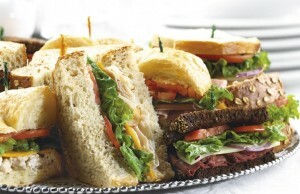 Set up a buffet style spread for your event with sandwich trays, group style salads, even group style soup and chili. This is a great way to allow everyone to mix and match to their desire. It also provides a good environment for networking and mixing while picking out their meal. You know there will be some who want a full sandwich plus another half. Others will opt for a full salad with the ingredients they love. And still others will want a little of everything – half a sandwich a little salad, and some soup.